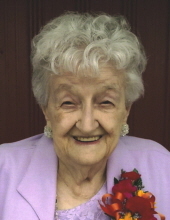 Eileen Ruth Schroeder, 88 of Gibsonburg passed away January 25, 2019 at Bethesda Care Center, Fremont. She was born April 17, 1930 in Bradner to the late Millard C. and Blanche J. (Immel) Jones. Eileen married Robert W. Schroeder and he died in 1962. Surviving are her three children; Virginia E. (Joe) Wyant, Fremont, Marvin R. Schroeder, Bradner and Darlene M. (Roy) Roberts, Gibsonburg; grandchildren; Jessica (Aarron) Weisenauer, Fremont, Ben Schroeder, Nolanville, TX, Dustin (Ashley) Schroeder, Bowling Green, Sarah Schroeder, Oregon, Evan (Alicia) Schroeder, Reynoldsburg, Abby (Michael Hefferon) Roberts, Fremont and Katy (Wesley Campbell) and Emily Roberts, Gibsonburg; great-grandchildren, Dylan, Brenden, Logan, Alivia, Lily, Oliver, Zoe, Parker and Ava. She was also preceded in death by grandson, Matthew C. Roberts. Eileen was a graduate of Montgomery Local Schools and a member of Bradner United Methodist Church. She liked to crochet, embroider and complete word search puzzles. Most of all she enjoyed visits from her grandchildren and great-grandchildren. Visitation is Tuesday, January 29, 2019 from 11 am -1 pm at Hoening & Son Funeral Home 133 W. Tiffin St., Fostoria, OH 44830 with funeral services beginning at 1 pm with Pastor Vernagaye Sullivan, presiding. Burial will follow in Graham Cemetery, Wayne. Memorials are suggested to Bridge Hospice, Bowling Green or Stein Hospice, Sandusky. To send flowers or a remembrance gift to the family of Eileen Ruth Schroeder, please visit our Tribute Store. "Email Address" would like to share the life celebration of Eileen Ruth Schroeder. Click on the "link" to go to share a favorite memory or leave a condolence message for the family.